Some of the very last Zondas are coming from Pagani before the C9 replaces its production. One of these is this Tricolore special edition which was recently photographed in the factory showroom by our friend Julien Giambagli of Supercarfrance.com. It might become Pagani’s ultimate road-going Zonda. Tricolore is a one-of built for the Spanish importer Guarnieri in Marbella, Spain. Like the Cinque editions that were built for a Hong Kong dealership, the Tricolore has numerous special features including the flappy-paddle gearbox. 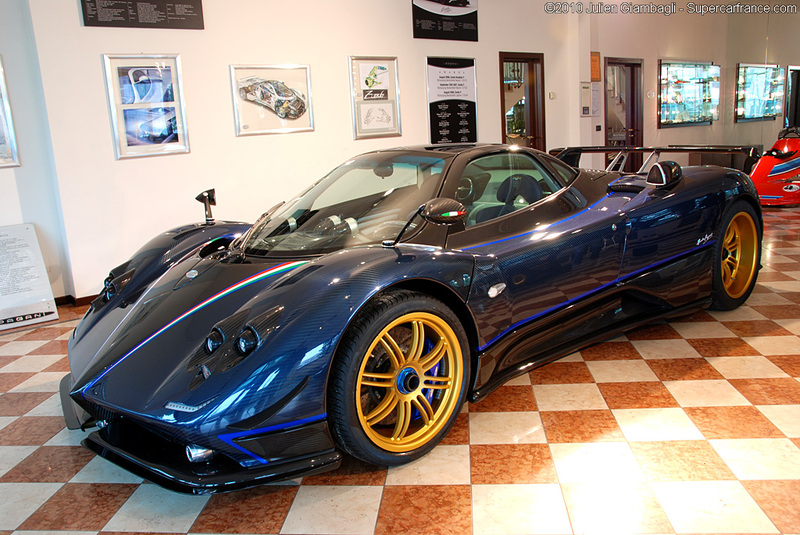 The car uses tinted carbon fiber for its colored stripes and also has upgrades from both the Cinque and Zonda R.
Today we can present three excellent images of the Tricolore from Pagaini’s own showroom in Modena. We hope to get more details once Pagani releases their own information and images.